An ice glacier in Iceland erupted on Tuesday gushing out towering fountains of hot lava, ash and steam on April 12. A glacier that had been lying dormant for about 200 years, Eyjafjallajokull burst out spewing out fire, ash, black smoke and thick white steam, and also triggering flash floods in the region. At least 800 people were evacuated following the eruption as the heat melted the glacier giving way to flash floods. 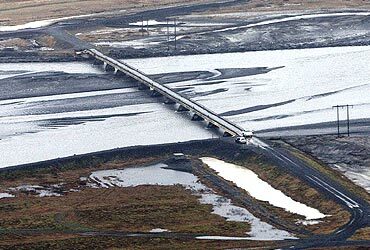 Iceland officials said the water level in the area had risen significantly since the eruption and that workers had smashed holes on the ground to let the water flow under. According to the National Aeronautics and Space Administration, combined with rising water temperature, the increase in streamflow also signalled the onset of a jkulhlaup: a flood caused by an eruption under a glacier. 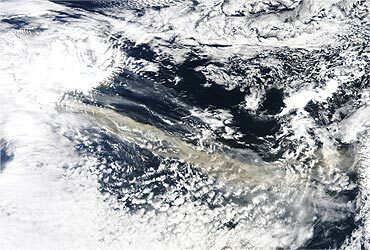 The volcano sent up a huge cloud of ash that has sent the European sir space into a state of chaos, disrupting flight schedules for at least two days. Fountains of lava and ash, as tall as 30-storeyed building, were seen flowing out of the mountain in images captured by spectators. This was the second volcanic eruption within a month on an island that is known to have the highest number of volcanic mountains. Just two weeks ago, another mountain Fimmv rduh ls had erupted and gushed out lava till April 12. However, it did not cause any casualties. The Eyjafjallajokull volcano, situated beneath Iceland's fifth largest glacier, has erupted five times since Iceland was settled in the 9th Century. Also officials fear another eruption in the neighbouring Katla glacier, which has always erupted following the Eyjafjallajokull in history. 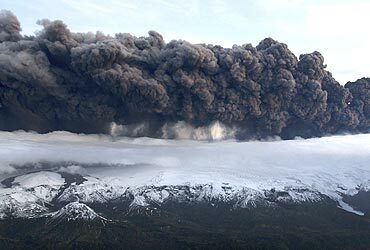 Eruption of Katla, located under the huge Myrdalsjokull icecap, is likely set off massive floods and blasts, officials said. Iceland is not strange to volcanoes -- sitting on the boundary of two plates on the Earth's crust, the island often witnesses eruptions as it pulled in two different directions by the two plates. According to Wikipedia, the island has at least 130 volcanic mountains of which only 18 have erupted since the settlement of Iceland around 5000 years ago. "Magma from deep inside Earth rushes upward, filling the gaps and fueling Iceland's volcanic eruptions, which occur about once every five years," The National Geographic has said of the eruptions in Iceland. Among the largest eruptions in Iceland were the Laki mountain in 1783, the Eldgj eruption in 934 AD and Holocene eruptions, which were said to be larger. The island is located on the Mid-Atlantic Ridge and there is a volcanic hotspot underneath the island. 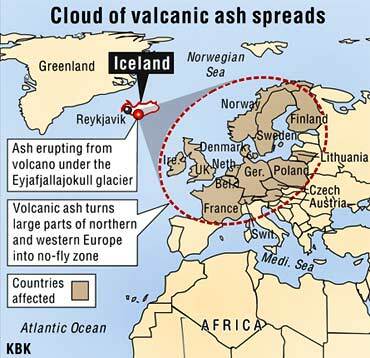 The reason for the frequent outbursts is that Iceland sits on the boundary between the Eurasian and North American Plates, and most volcanic activity is concentrated along the plate boundary, which runs across the island from the southwest to the northeast of the island. There is also offshore volcanic activity, especially off the southern coast, including submerged submarine volcanoes and even newly formed volcanic islands such as Surtsey and J lnir, Wikepedia says. Due to the rifting process between the separating plates, Iceland often witnesses sub-glacial and regional fissure eruptions. However, Iceland is just one of the many hotspot volcanic regions on Earth. A volcano is a rupture or opening of Earth's surface that allows hot magma, ash and gases to escape from the crust. Most of Earth's surface has been formed due to the innumerable volcanoes that occurred in sea floors and mountains, while gases emitted from volcanoes formed the atmosphere. Volcanoes on the ocean floors are called as submarine volcanoes, and volcanoes under glaciers are called sub-glacial volcanoes. Why does the Earth's crust erupt? Volcanoes occur due to any of the three reasons: if the region sits on diverging plates, if the region sits on converging plates or if the region sits on mantle plume or a region where Earth's surface is below fluids that give rise of hot gases. While diverging tectonic plates pull apart, converging plates come together causing tremors in the Earth's crust and eruptions thereby. For example, volcanoes in the Pacific Ring of Fire are because the region sits on converging tectonic plates. Volcanoes can also occur because of stretching and thinning of the Earth's crust as in the African Rift Valley, the Wells Gray-Clearwater volcanic field, the Rio Grande Rift in North America and the European Rhine Graben with its Eifel volcanoes. Diverging tectonic plates are at mid-oceanic ridges, where two tectonic plates diverge from one another. Hot lava emitted from the volcano cools and solidifies slowly forming a new Oceanic crust. Converging plates are where usually an oceanic plate and a continental plate collide, causing the oceanic plate to go under and releasing magma to reach the surface, leading to a volcano. Volcanoes can also be due to mantle plumes and these are called hotspots. Volcano hotspots are also found on rocky planets and moons. The Hawaiian Islands, the Snake River Plain, the Yellowstone Caldera on the North American plate are known as hotspots. A broad classification of volcanoes can be on the basis of regularly they erupt. Volcanoes that erupt regularly are called active volcanoes, while those that had erupted in history and have not erupted lately are called dormant volcanoes. Extinct volcanoes are those that are not likely to erupt ever as they have no trace of lava within. Predicting volcanoes is as difficult as predicting earthquakes. Symptoms such as unrest in the Earth's crust and sudden earthquake are often indications for a volcano, however these are not definite. 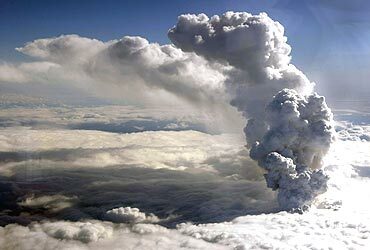 The International Association of Volcanology and Chemistry of the Earth's Interior has named 16 eruptions in recent past as the Decade Volcanoes for the enormity of the devastation and losses incurred. The list includes: Avachinsky-Koryaksky, Kamchatka, Russia; Colima, Jalisco and Colima in Mexico; Mount Etna in Italy; Galeras in Colombia; Mauna Loa in Hawaii, US; Mount Merapi in Indonesia; Mount Nyiragongo in Congo; Mount Rainier in Washington, USA; Sakurajima in Kagoshima Prefecture, Japan; Santa Maria/Santiaguito in Guatemala; Santorini in Cyclades, Greece; Taal Volcano, Luzon, Philippines; Teide, Canary Islands, Spain; Ulawun in Papua New Guinea; Mount Unzen, Nagasaki Prefecture in Japan and Vesuvius, Naples in Italy.